Durham Town Hall is located at 30 Townhouse Road, Durham CT 06422; phone: 860-349-3452. Photo: Thomas Lyman House, ca. 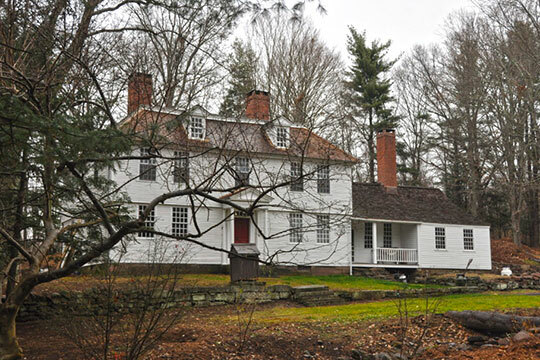 1775, 05 Middlefield Road, Durham, CT. Listed on the National Register of Historic Places in 1975. Photographed by User:Magicpiano (own work), 2015, [cc-by-3.0 (creativecommons.org/licenses/by/3.0)], via Wikimedia Commons, accessed July, 2016. Geographical constraints, as well as advantages, and a particularly heterogeneous settlement population drawn from all over the Connecticut Colony, were some of the factors that shaped the course of Durham's history, transforming the town from a self-sufficient farming village into a relatively cosmopolitan center of commercial agriculture and small-scale, agrarian-based industry. Prior to settlement the Town of Durham was known as the Coginchaug, or Great Swamp. Most of the land in the town had been granted to individuals for distinguished service to the colony in military or civic affairs in the seventeenth century. All of these men were absentee owners; none were anxious to occupy what was then one of the least desirable areas for settlement in the colony. Swamp and marshland occupied most of the central part of the area, surrounded by rolling hills overlaying rocky ledges. Less than one third of the mere 15,000 acres was suitable for cultivation. The majority of the absentee owners were from Hartford, with a smaller group from Guilford. A petition in 1699 by the Guilford interests to locate the town plat in the southern part of town was acted on favorably by the General Court. But the more powerful Hartford group was successful in having this decision overturned, with the result that the town was laid out at its present location in 1703, where the land was owned by Hartford men. Jan Cunningham, Greater Middletown Preservation Trust, and John Herzan, Connecticut Historical Trust, Main Street Historic District, Durham CT, nomination document, 1985, National Park Service, National Register of Historic Places, Washington, D.C.